In the last post I linked to the May Review column where I annotated a whole bunch of great books about nature, wilderness, and finding God in the great outdoors. Some were overtly Christian, although some were not. I don’t know how many other so-called Christian bookstores stock this kind of stuff, but we hope you like our distinctiveness in bringing together these genres and perspectives, books and authors not commonly found together. Do check it out if you haven’t; it’s a fun early summer list! 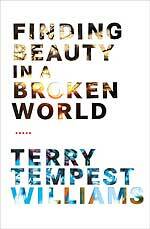 I’ve just recently finished Terry Tempest Williams brave and unusual and deeply moving book Finding Beauty in a Broken World (Pantheon; $26.00.) It deserves more than I can give but I thought I’d offer a few remarks and reflections. We commended her in the previous post, so this is a natural follow-up, as she is known as an eminent nature writer, a memoirist of place, a passionate critic of the foolish policies of progress that have eroded sustainability and sanity. We like her a lot. Finding Beauty in a Broken World is a sprawling, big book, divided into three distinct portions. This is a bit unusual, and although she weaves the themes of each portion together a bit, I would have wished for more connection, making explicit what I presume is understated purposefully. Still, at the end my jaw was dropped in one of those experiences of epiphany and connectivity. It really did come full circle. Even as I type that quote it dawns on me—” stories told through fragments,” how did I miss it?—that the fragmentary nature of this book (some pages only have one sentence, some appear to be journal entries or quotes from other books) is itself mirroring these fragmented tales, made luminous as they are brought together. Hmm; a stroke of brilliance perhaps, some hint at form and content? This first part is brief but beautiful. 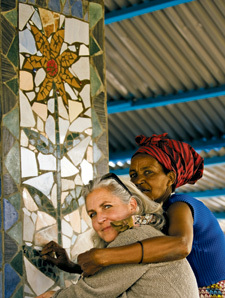 She tells about the “city of mosaics” and tells of her learning the craft, in this mosaic workshop, so that she could “learn a new language with my hands.” It is interesting that this art form uses broken pieces. It is an imperfect beauty. The second more lengthy portion is more typical terrain for Ms Williams as she has volunteered to serve as an assistant with the world’s leading scholar of several species of prairie dogs. She is at Bryce Canyon National Park, assisting the study of this fascinating critter, a controversial animal beloved and hated in the developing West. She makes a very strong case for the preservation of prairie dog towns and it is helpful to learn of how the eco-spheres of the prairie lands are dependent and inter-dependent on these rodents maintaining their traditional habitat. It is also interesting how government mandates of protecting habitats of such creatures are and are not followed, are contested and ignored. As a small side-note, she is banned from some National Parks because she was a signature of a class-action type lawsuit against the feds in their disregard for environmental law protecting the dogs. Who knew citizens could be banned for such things? Outrageous. It is not a large portion of the book, but the expose of the corruption in the Fish and Wildlife Service, the Bush appointee Julie MacDonald who so undermined the mandates of law, is important as we assess the current state of environmental law after recent years of disregard. In this well-written portion she laments the gross mismanagement of Western lands, and portrays the gross hostility of those who love to squish to death these small creatures (not to mention the companies that burn them alive in their burrows which she describes in a harrowing paragraph.) This battle about exterminating the dogs is symbolic of much of the public debate around ecological living, and her personalizing it—working in this one spot, marking and observing these mammals’ behaviors, following their habits for 8 hours a day sitting in a little tree stand—was helpful and informative. (Her method, offering fragments of repeated numbers and letters from her daily log was tedious, and I admit to skipping pages at at time, having “gotten” the painstaking monotony of natural science research in action.) Still, learning about these “prayer dogs” was very interesting and oddly compelling reading. You may want to read “Report from the Burrow” or glance around the website of WildEarth Guardians which she recommends. being, of course, God, then a ranking of human races, and so our judgements move down “the Great Chain of Being” until we touch rocks. This is the attitude of power, and it hinges on who is in control. Who has the power over whom? How does this kind of behavior infiltrate the psyche of a culture? And what are the consequences of scala natura? The third portion of this book was even more captivating, and I was riveted by the tale she weaves of her journey to Rwanda with a Philadelphia artist, Lily Yeh, whose movement of “Barefoot Artists” work to create spots of beauty to memorialize the inhuman brutality of the genocide there. Her time in this crowded African country is told powerfully and engagingly and the relationships that develop in this part of the book moved me as deeply as any great novel. Whether you know much about this place (think of Hotel Rwanda) or very little, this is an amazing bit of writing and very, very worthwhile reading. Some of it is horrific as she tells of listening to the stories of the genocide victims; some is healing in a manner made known to the world by the South African Truth & Reconciliation Commission. That is, it is hard, hard stuff, but told in the service of healing, justice, and even forgiveness. There is great grace reported here, and their desire to offer an artistically rich spot, a regional memorial, as a symbol and place of remembrance, is truly one of the most amazing things about which I’ve ever read. Much could be said about this moving last third of the book, but I cannot do it justice. The plot develops and unfolds as we read of Terry’s month-long stay and friendship with rural Rwandan folk (and of a subsequent visit later with some fabulous episodes which I won’t spoil by telling.) She studies the local soil erosion, visits the Congo and hears of the killing of guerrillas (this is the area where Diane Fossey did her famous research), the rise of evangelical religion, the creation of small local businesses, like a sunflower oil press. The arts are celebrated, schools are started, art classes begun, villages beautified and the architectural plans and creation of this mosaic-laden memorial completed. Through rain and illness, hard stories and great laughter, multi-cultural teams find beauty as hopeful as they empower and work with those at the Genocide Survival Village in Rugerero. A Catholic mystic writer once said that beauty can save the world and my esteemed friend an editor of Image, Greg Wolfe, will have a book out soon with that title. I do not think it is so. But it sure can help, and my simple formulation is woefully inadequate. It does more than “help.” Such gifts of true beauty are, as Calvin Seerveld says in his book of this title, a “rainbow for the fallen world.” People of Biblical faith can give away their artistic gifts, he says, as signs of redemptive hope, like the dove returning to the ark (Seerveld’s other famous book about the arts is entitled Bearing Fresh Olive Leaves.) Terry Tempest Williams and her gang of barefoot artists do just that, offer hope in color and texture, fragments of light, forming truth and goodness. Thank God for this brave and important book and the work it so passionately documents. What connections there are that linger, nearly unspoken, between art, justice, ecology, life. “Grace” sings Bono of U2, “makes beauty out of ugly things.” Finding Beauty in a Broken World by Terry Tempest Williams is an example of just that. As they proclaim in Rwanda, Ukurikurakiz! Truth heals! Read it and take hope. You can see pictures of the memorial, and other great global arts projects of the Barefoot Artists project at their glorious website. There is even a 24-minute film you can watch. By the way, kudos to Zondervan for recently publishing two books on Rwanda (rather a risky move for a publisher, doing not only one, but two.) Both are excellent. Mirror to the Church: Resurrecting Faith after Genocide in Rwanda Emmanuel Katongole (Zondervan) $15.99 Katongole is a prof at Duke and co-director (with Chris Rice) of their Center for Reconciliation. He is a Catholic priest of the Kampala Archdiocese in Uganda. Fr. K had some help in the writing by Jonathan Wilson-Hartgrove. Not only does this serve as an excellent and brief introduction to the horror of the Hutu’s and Tutsi’s barbarism, it explores what we can learn, and how the gospel must transcend national and ethnic differences. Very important stuff, indeed. As We Forgive: Stories of Reconciliation from Rwanda Catherine Claire Larson (Zondervan) $15.99 This well written collection is inspired by the award-winning film of the same name. As We Forgive was the Gold Winner for Best Documentary in the 2008 Student Academy Awards (yes, sponsored by the Academy Awards!) An evangelical Episcopalian living in the DC area, this film-maker is a talented, sharp young woman and her film would be a good compliment to anyone reading Larson’s powerful book. You can get info at the As We Forgive website. And thank you for your hard work to put together book reviews by genre. Byron – having just returned from Rwanda, I continue to devour every single book on the genocide (before, during, and after) that I can get my hands on. Thanks for mentioning Katongole’s “Mirror to the Church.” An amazing, insightful, and convicting read. It’s one that I think all believers – particularly North American believers – should no only read, but study. Recommending a devastating set of short stories, Uwek Akpan’s Say You’re One of Them, which ends with a story set in Rwanda. These stories, written by a Jesuit priest, are not for the faint of heart. Byron, the Terry Tempest Williams book looks great. Can’t wait to see it.